As moments go, Carol Metchette’s final international appointment could scarcely have been more emotional. One of world hockey’s finest umpires, the two-time Olympic whistle-blower closed out her career on home soil, taking charge of the FIH Champions Challenge I final between Australia and the USA in early October. Pre-game, her daughters who presented her with flowers to commemorate the occasion, something that came as a complete surprise. “How they didn’t tell me and how they got on the pitch without seeing me, I’ll never know!” she said. “I did have tears in my eyes but at the end of the day, I knew it wasn’t about me. There was an important match for both teams who wanted to win badly to be promoted to the Champions Trophy. The tie itself turned out to be a reasonably low-key affair, Australia storming to a 6-1 victory to win the Challenge crown. But Metchette says there were still plenty of memories from the day. “It turned out to be a bit one-sided but I was lucky to have the busier first half and it was still quite competitive at that stage especially as USA went one up. 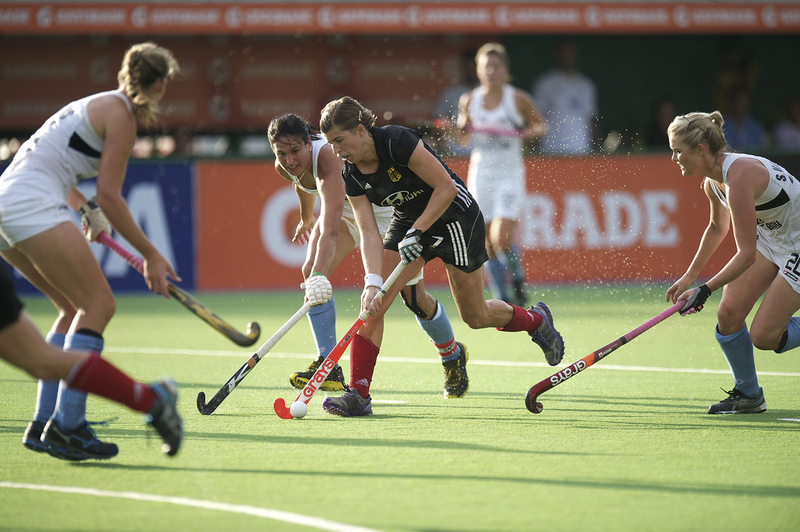 Metchette had to retire from the international hockey due to the current age limit of 47 for umpires. That she has passed such a limit is incredible in itself with precious few who have encountered her relentlessly positive and friendly outlook likely to pitch her at such an age. Indeed, four days prior to her final game, umpires manager Jean Duncan confirmed Metchette had produced the best fitness score of all the umpires from a team including some up and comers almost 20 years younger. It brought to a close an international umpiring career that saw her rise incredibly quickly to the top of the world game after an impressive stint as a player. With Old Alex, she played in the first team for 18 years, winning her share of titles, notably being part of the successful 1988 and 1991 Irish Senior Cup sides. On her retirement in 2002, she “started umpiring really just to give something back to hockey”, beginning her epic second career. “I couldn’t have envisaged how far it would take me. It was more than I could have dreamed of, to go to two Olympics, a World Cup and the Champions Trophy. I had ten great years and fantastic memories. I’m now looking forward to my new venture as a mentor for the EHF Umpires Development Programme and I am honoured to have been asked to do it. “I will miss all the wonderful friends I have made all over the world. I’ll miss travelling the world especially to new countries. I’ll miss the challenges that each tournament brings and performing at top-level sport. “I won’t miss the huge spreadsheets I have to do each time I go away with how the kids are getting to and from school and to all their after school activities. Also, I won’t miss all the money I have spent on childcare while I’m away!